Understanding how the brain works will improve education. The competent individual moves to self-directed, learning typically interspersed with episodic directed learning experiences. Practice for improvement becomes extremely important. Mastery of a field requires lifelong learning and deliberate practice. If we are to improve the educational process then these concepts of how we acquire knowledge must be integrated into the educational system. It appears that we must first learn facts, begin to apply them through rules, modify those rules through analytical processes, and then transcend the rules through perceptual learning. There is strong evidence that it requires about 10,000 hours of application over at least 10 years to reach the expert level. This requires practice, which must be deliberate and focused. It also appears that we learn best when we move from easy to difficult and if we progress from facts to rules to knowledge. Application of these principles in education could improve all of us but a major goal will be the production of more experts in practice in every advanced field. Current cognitive science begins with experience, both events and information. It is then organized in the brain to be useful, and usually this is deliberate. This organization leads to the rational probabilities to be used and this form of information processing is reflected in guidelines and algorithms. The educational process could be greatly improved by incorporating the current information available about how the brain learns with modifications whenever the new data available on these processes is validated. An immediate goal can be transition from our current time-based stepwise educational process to an untimed system based upon demonstration of competencies. The ultimate goal of our educational process should be lifelong, self-directed learning which leads to mastery of the chosen field. DONLIN M. LONG is Professor of Neurosurgery at Johns Hopkins. 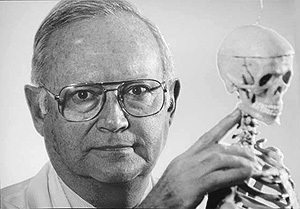 In 1973, he became the first director of the Department of Neurosurgery at Johns Hopkins which he founded. He remained neurosurgeon-in-chief at the Johns Hopkins Hospital and Director of the Department of Neurosurgery until 2000. His ongoing clinical research includes the evaluation of the causes of spinal pain, and development of minimally invasive procedures to diagnose and treat spinal pain without surgical intervention, and competency theory in medical education. He received his medical degree from the University of Missouri. He served his internship in surgery at the University of Minnesota Hospitals. He then completed residency training in neurological surgery at the University of Minnesota Health Science Center and the Brigham-Children’s Hospital Medical Center of Harvard. He received a PhD in neuroanatomy from the University of Minnesota. He served as Clinical Associate at the National Institutes of Health in the Branch of Surgical Neurology while a member of the United States Public Health Service. In 1967, he became Chief of Neurosurgery at the Minneapolis Veterans Administration Hospital and pediatric neurosurgeon at the University of Minnesota. His initial research focused upon brain edema and the introduction of steroid therapy for the treatment of brain edema and spinal cord injury. He also studied ischemia, hypoxia, and the blood brain barrier. He was a founding member of the International Society for the Study of Pain. He chaired the study group which managed the introduction of spinal cord stimulation into clinical practice. With engineering colleagues, he developed transcutaneous electrical stimulation (TENS) as a clinical tool, designed an implantable peripheral nerve stimulator, and helped design the first implantable rechargeable nervous system stimulators and drug delivery pumps for medication infusion. He served on the Board of Directors of the American Pain Society and was a founder of the Blaustein Pain Treatment Center at Johns Hopkins. He was a founding member of the Cervical Spine Research Society, and the AANS-CNS sections of Pediatrics, Spine, and Basic Sciences. His clinical practice has focused upon skull-base tumors, particularly acoustic neuromas. This focus includes one of the world’s largest series of operations upon acoustic neuromas, a similar large experience with meningiomas of the base of the skull, and a broad experience with all other kinds of benign tumors of the skull base. He has published over 250 peer-reviewed articles on neurosurgical topics. He has written or edited 15 books and has participated in the production of over 100 chapters for textbooks. He was a founding editor of the Journal Spine and continues to serve as founding editor of Quarterly Neurosurgery. He has been an editor-contributor for the AMA panels for Evaluation of Permanent Impairment and serves on the editorial board or as a reviewer for 18 national and international journals. He is a member of the principal staff of the Applied Physics Laboratory and has served on the NIH Board of Scientific Counselors. He has served as neurosurgery consultant to the Social Security Disability Panels for spine and nervous system. He has been neurosurgery representative to the Counsel of Academic Societies and served on the Administrative Board of that organization. He is on the advisory board of the Johns Hopkins Engineering Research Center and the Center for Complementary Medicine at Johns Hopkins. He is a member of the advisory board of the Agarini Foundation for Research in Neural Regeneration, a member of the Society of Industry Leaders, and a member of the Faculty of 1000. He belongs to 37 professional societies in which he has past, active or honorary membership. President Larry Millstein called the 2,260th meeting to order at 8:22 pm November 13, 2009 in the Powell Auditorium of the Cosmos Club. The minutes of the 2,259th meeting were read and approved after a short discussion. This topic is somewhat different, Mr. Long began. It is about basing education on competency, rather than time and place. It is a new concept, perhaps 20 years old. It is being taken very seriously in medical education, especially post-graduate. It also involves the concepts of mastery and the question of how we ensure lifelong learning. Currently, the goal of medical education is competency. Competency is gained by a specific progression of learning. Competency is not the final goal; it is a way station required to progress to mastery. The progression to competency begins with a novice, who has to learn facts and skills under direction with immediate feedback. The novice begins to apply facts and skills by rules, which are still given to him by others. Next, the advanced beginner begins to understand the need for self directed learning. He learns the rudiments of analysis and begins to expand the rules. Finally, he achieves competency, which is characterized by self directed learning and use of rules expanded and developed by experience and analysis. A few practice continuous improvement, pursue learning independently, assess themselves regularly, and progress toward mastery. That, however, is a small group. Competency based learning is the new goal of education. With competency based learning, time requirements are eliminated. There are no freshmen, sophomores, juniors. Progress is determined by goals and milestones. Goals are decided by the students. They prove they have learned and progress as rapidly as they can. There is a movement to make this the standard of medical education. It is being done mostly in post graduate study at present, but Mr. Long says there is commitment to it and several countries have made steps to apply it in medical school education. Is it practical? There is precedent. In the past in the United States, when we were short of physicians, pre-medical school has been reduced to two years and medical school to three years. Recently a demonstration of the practicality was done in Canada, where a famous orthopedic surgery program was reduced from seven years to four. The European Union has adopted competency based physician training as a policy. Mr. Long believes the main problem in education is not not learning facts, but that we don’t program the brain to learn. This requires ongoing study and deliberately engaged practice. It does not happen by experience alone. As practitioners gain experience, they increasingly develop, modify, and expand rules. Eventually, rule-following becomes knowledge based. With practice, they develop skills to apply their own rules quickly, which is often important. Use of the same information in a variety of venues is also important. There are oral learners, visual learners, and there are some who learn by doing. Repetition turns out to be extremely important. Great musicians practice as much as ten hours a day. The ones who lose their abilities with age are the ones who stop practicing. 10,000 hours seems to be about what it takes to gain mastery in many fields. The key to avoiding a plateau is deliberate learning, working toward getting better every day. The cognitive skills need to be continually fostered. Practice must be deliberate and systematic in order to have the best effect. One great problem in neurosurgery training is that most situations do not provide frequent enough opportunity for practice on difficult problems. Achievement of true mastery is unlikely to occur without extensive practice, and useful discoveries come primarily from people who have achieved mastery. What is known in cognitive science? We need to take that kind of information and use it in education. No current theory is adequate, and that means education will have to adapt as information develops, and that is not characteristic of education. There is much to be learned. Some aspects of cognition, such as decision making and fact gathering, seem to be understood fairly well; others are not. People seem to reach, with enough practice, a level where they make knowledge based decisions without analysis. We do know that learning progresses from the simple to the complex. Eventually, if continuous learning is practiced long enough, people make complex decisions by a perceptual process. They see a problem; they immediately know a solution; they act on it. He ended with some philosophy, noting that he was speaking to the Washington Philosophical Society. Aristotle told us we only know what we experience. David Hume held that the self was just connected to experiences. William James postulated a stream of consciousness based on experience, but thought there was something more in the process but he wasn’t sure what it was. His student, John Dewey, said that that “something more” occasionally produced thoughts of great importance. This was best expressed by Josiah Royce, who said that many important thoughts and conclusions occur without analysis and without experience, and this is the fundamental basis of perceptual knowledge. Descartes said there must be some important aspect of mind that is not physical. Bishop Berkeley told us no experience is real; everything is in our stimuli, in the mind. Daniel Dennet wrote that the brain itself is biological, but thought and consciousness are not. Perceptual research strongly favors the biological theories, but it tells us that experience is not the only process. Much elaboration occurs in the brain, without obviously thinking about it. We don’t have neurological explanations for this. He recalled a recent study (Kiani & Shadlen, Science, 2009) that showed that individual nerve cells in the parietal lobe gave animals reliability of interpretation, accuracy of choice, and confidence in decision. This discovery of such a graded response in individual cells is astounding, implying that individual cells can estimate probabilities. It denies the proposition that brain cell function is all-or-none, which has been a standard assumption. Mr. Long concluded saying this is a very brief look at a new concept, competency based education. He hopes that it will spread from medicine throughout the education field. He expects that as it develops, we will increasingly rely on knowledge about how the brain learns. One question was about the assumption that hoofbeats indicate horses and not zebras. Does this represent a hindrance by common teaching patterns to the kind of development he advocates? Mr. Long said such assumptions reflect perceptual learning. If you are in Washington, hoofbeats most likely do indicate horses. Several questions dealt with concerns about what might be lost from by focus on demonstrable capabilities and what is left out from people’s training. Mr. Long’s answers indicated that care must be taken to keep the relevant skills and knowledge in the program, but he gave examples that indicated that substantial efficiencies can be gained with little or no loss. One question dealt with motivation. Mr. Long observed that nobody knows how to motivate people. In his field, medicine, in general, there is a lack of focus on outcomes. The contributions and capabilities of a few people are known, because they are published, but for most practitioners, they are not. Another person asked if statistical analyses might help focus on outcomes. Mr. Long gave one example where just such an approach had a dramatically positive effect in survival after heart surgery. But that is not common. Another person pointed out that, although Mr. Long had spoken of neuroscience in connection with education, his examples were based entirely on behavior. Mr. Long acknowledged the point, and said, essentially, that is the current state of the field of neuroscience. After the talk, Mr. Millstein presented to Mr. Long a plaque commemorating the occasion. He welcomed Mr. Long to membership in the Society. He announced the next meeting and presentation. He made the parking announcement and other housekeeping announcements. Finally, at 9:45 pm, he adjourned the 2,261st meeting to the social hour.